Parents should not be faulted for being totally confused! I found this product at a local big-box store, and my first thought was ” Created by a dad; how terrific!” Then I thought a bit more. How would a parent know when to go sleeveless? Warm weather? Babies who still cry when fully swaddled? Most babies are still crying after you finish swaddling them, even though they calm down after some shushing and swinging. Without the use of the other infant calming techniques (the 5 S’s from The Happiest Baby on the Block) you have served an incomplete meal of comforting. But a new parent would be truly forgiven for thinking that their newborn didn’t like being swaddled with their arms in when they continue to cry. Newborns are not seeking freedom; after 9 months in a studio apartment, they are most comforted in a smaller space. That is why being cuddled is so wonderful for them. 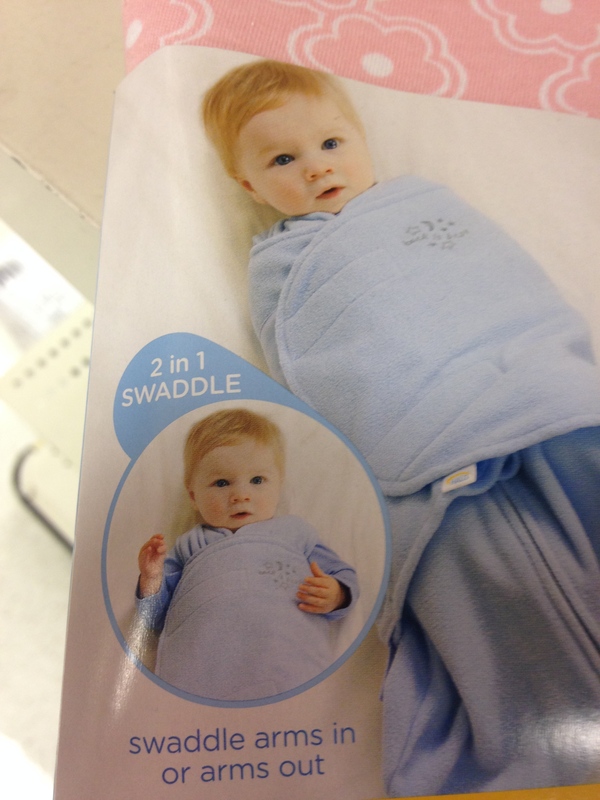 Swaddling firmly prevents those arms from flailing when they are crying. With their arms free, parents will see more of the Moro (startle) reflex and will have to hold them more firmly to replicate that cozy touch that swaddling provides. When put down in a loose or partial swaddle, babies can start crying again. This appears to be a plea to be picked up again, but it is more likely that your baby wants to be firmly held, all the way up through their arms and shoulders. When is the arms-out swaddle just right? After 3-4 months, babies often have more arm control and less frequent Moro reflex responses. They can sleep well without a full swaddle, and this product makes it easy to wean your baby from swaddling. But nothing in the exterior packaging explained that. I am thrilled that there are good products out there for parents to choose from. But the most valuable ingredients, knowledge and experience, still seem to be the hardest items to find. This entry was posted in infant sleep strategies, newborns, parenting, toy/equipment review and tagged happiest baby on the block, newborn sleep, swaddling on June 29, 2014 by Tranquil Babies. Warm weather has arrived, and with it the question of what to do with a baby that sleeps best swaddled. The answer: dress for the season! Babies that are too warm when swaddled have hot ears and sweaty necks. Did you know that overheating is one of the risk factors for SIDS (Sudden infant Death Syndrome)? If your baby is too toasty this summer, you may need to change your routine and go shopping. Try using a thin muslin wrap and just a diaper, and keep a fan or air conditioner going. If that still isn’t enough, then you have to consider no wrap at all. A loose wrap, especially a loose wrap that partially covers the face, is not a safe choice. Use all the other strategies that help babies sleep, including white noise and pacifiers. After you make changes, don’t forget to re-check your baby’s ears and neck to make sure that your strategies worked. Pleasant (and cooler) dreams tonight! This entry was posted in child safety, infant sleep strategies, newborns, parenting and tagged infant safety, infant sleep issues, SIDS, Sudden infant Death Syndrome, swaddling on June 3, 2014 by Tranquil Babies.